Low G Tuning . . . . Can we talk? 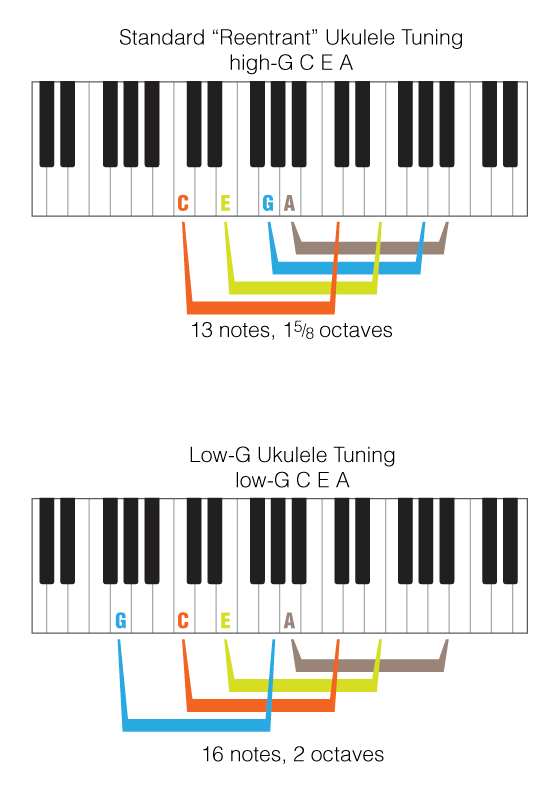 Concept of Low G tuning on their ukuleles. I hope within this blog to clarify a few points . . .
Q. Is Low G tuning superior to standard tuning? A. Nope . . . it’s just a different tuning and a matter of preference. Major players use both tunings. Q. Are some ukuleles built to Low G tuned . . .
Q. Do I have to purchase a different set of strings for Low G? A. Most string manufacturers do make sets that have a Low G. Some are wound, some are not. Q. Which Low G should I use: a Wound or Unwound? Historically the ukulele has been tuned to what is called a RE-ENTRANT tuning . . . . This fancy word just means that the order of strings pitch-wise are not in the usual pitch order. First of all . . .we need to define string names and numbers. The string closest to your chin is the 4th string then they proceed to 3rd, 2nd and 1st with the 1st string being closest to your knee. In the standard RE-ENTRANT tuning the 4th string is a G above middle C . . . Then it drops DOWN to middle C then up to E then finally up to A. In the Low G tuning that 4th string is the G BELOW middle C then the rest of the strings are the same. So you see, in the standard tuning it goes High then drops down then goes back up again. That’s RE-ENTRANT tuning. Many stringed instruments from the renaissance period were RE-ENTRANT tuned instruments as well. That difference is tuning is what gives the uke its “traditional” Hawaiian sound. The High G gives a brightness and lift to the sound that is distinctive apart from all other instruments. In my playing I have preferences, song wise, for High G and Low G . . . So I find it necessary to have a couple of instruments on hand to have that option. Some songs just don’t sound “Hawaiian” enough for me with the Low G tuning, so I use my High G instruments. . . . You might notice that Jake Shimabukuro almost exclusively plays with a High G tuning. Having said that, many other Hawaiian players such as Daniel Ho or Herb Ohta Jr. often use Low G tuning. Kimo Hussey is another Hawaiian player who uses Low G almost exclusively. So as you can see, it truly is a matter of preference. One distinct advantage of Low G tuning is found in playing Jazz. The diminished 7ths, minor 7ths etc . . . sound very “tight” and jazzy with that Low G tuning. There is just something inherent in the jazz chord voicings that is enhanced by the Low G tuning. This is most likely why Kimo Hussey prefers the Low G. Another jazz player who uses that Low G is Glen Rose. Forget it. Just doesn’t sound right. Can you see the problem here? You need at least 2 ukes to accomplish all the music and types of music out there for the ukulele. Most of the pieces in my large Ukulele Instrumental eBook were conceived using a standard tuned uke. The Christmas Ukulele piece likewise . . . In recent months I have been using a Low G and many of the chord/melody pieces have been conceived on that uke. However, those pieces will sound fine on a standard tuned uke as well. You see, the melody notes don’t extend down to the 4th string. They are all mostly found on the 2nd and 1st strings. This is definitely an open ended blog as I expect this discussion to be ongoing. ADDENDUM #1 One great advantage of the Low G tuning is that it gives the ukulele a fuller, lower, more resonant voice. It makes the ukulele sound bigger than it is. Put a Low G tuning on your uke and you’ll immediately think you have just purchased a brand new ukulele.